In Brandon Sanderson's intriguing tale of love, loss, despair and hope, a new kind of magic enters the stage- Allomancy, a magic of the metals. It's been a long time since I've ventured through some Sanderson. The last book I could recall reading from him was Firefight (Book #2 of the Reckoners trilogy). But if you're new here you know that I have a profound love for Brandon Sanderson and every once in a while, I must read one of his books to reimburse my reading experience because it's not complete. I'm just warning you now I have a lot to say about this book. And it's not everyday I give high fantasy books 5 star ratings. Grab a chair and some popcorn, you'll be here for a while. The Final Empire follows a ragtag group of outcasts with Allomatic powers trying to stop the Lord Ruler from wrecking even more havoc on the world and skaa. There is a tremendous amount of planning and preparation that goes into their plan to take the Lord Ruler down. Every last detail is thought out and it seems as if Sanderson has experienced this type of heist and he was just documenting everything he did. With Brandon Sanderson, you can't escape his well-crafted and ingenious plots. If you've been following the blogosphere and booktube for a long time and haven't heard of him for some unknown reason, all the reviews talk about how his stories will teleport you into a world you've never known. I think I've been holding off reading this book for a long time because I always go into his books wishing that I hadn't read it so I could just read it all over again. In short, he's a creative genius!! Sanderson writes about these incredible magic systems. In this book, he creates this new type of magic called Allomancy, where you can gain powers by swallowing and burning metals. Of course, this type of magic can only be used by certain people, Mistings and the Mistborns. Each metal brings a new type of power and there's even a reference sheet in the back of the book that I constantly referred to. 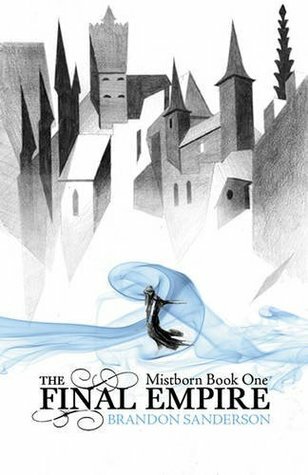 Now going back to the certain people, there is a huge difference between Mistings and the Mistborn. Mistings are those who can only use one metal to obtain powers from. Mistborns are very rare and can control all Allomatic metals. It's either you control one or all, nothing in between. This concept alone was mind-blowing. WHY IS HE SO GOOODDD?? His plot sets up for some pretty sick action scenes and you actually get to see Allomancy put into action. Not only did he create this concept but he stuck to it and created other conditions that went with it. This magic system beats all the other ones I've ever read about! I mean, who would think to write about swallowing metals? Vin, the main female protagonist, goes through and extremely fantastic character development. By the end of the book she transitions from a poor submissive street urchin to an unstoppable, superior Mistborn. She was insecure and docile, ready to be told what to do by Camon, his crew leader. And that all changed because of Kelsier... oh Kelsier. Kelsier brings her into his crew as one of his own and teachers her the ways of a true Mistborn. With him, she grows in strength and in mindset. Super well done, Brandon! Each of his characters are somehow involved in Allomancy. When he gives them a unique power to control, it tells us so much more about their personality. And when these characters use their abilities, it's up to them to figure out in which way they're going to use it: for the good or bad. Sanderson has created a new way of characterization by showing, not telling and through the use of power and magic. Sanderson's focus on his fantasy novels are not primarily the romance aspect, so it was so surprisingly to me that even the master of world-building and magic could make the love in this book blossom and make my insides flutter around. I blushed at the parts where Elend courted Vin. His romance is nothing near how Jennifer L Armentrout writes about the subject matter, but it's enough to see how love is represented in this society. Brandon Sanderson is perfection and it shows in the way he writes. You can feel his passion and his thoughts all in the stories that he writes. I had no qualms with this series so far and don't see myself having any problems with the sequels. Have you tried you some Sanderson yet? I haven't read a single Sanderson novel but it sure sound like I need to! Ohh if you do happen to try one out, I can't wait to hear your thoughts on it. I can't wait till you try it, or any one of his books for that matter! Awesome review Alex! You should just read ALL his books ASAP. I know The Way of Kings is 1000 pages long, and even more high fantasy than Mistborn, but it's good. Real good. 1000 pages?? That's so intimidating. I loved this book so much though and there is no doubt in my mind that I'm going to be finishing this book! Coinshot? That was my second choice. GAHH there are so many amazing abilities to choose from. Well they should just call me awesome and declare me a Mistborn!